The study, authored by a trio of independent researchers, documents resistance in a major crop pest called corn earworm, and adds to warnings that the popular GMO insect-resistant technology known as Bt, after the soil-dwelling bacteria Bacillus thuringiensis, has lost its luster. It is noteworthy as the first long-term, in-field assessment of transgenic Bt corn's effectiveness against one of the most damaging pests of sweet corn, field corn, cotton and many other high-value crops. Before publishing their findings, which cover 20 years of observations, the researchers presented them to the Environmental Protection Agency (EPA) as well as to the corporations that developed and market the traits, said Galen Dively, a University of Maryland entomologist and lead researcher on the study. Crops engineered with Bt genes express specific proteins known as (Cry proteins) that make the crops toxic to specific insects - the plants effectively provide their own insecticide - reducing the need for chemical applications. In 2015, more than 80 percent of the U.S. corn crop carried at least one Bt trait. Much of the corn now planted is engineered with multiple Bt Cry proteins, but the new research indicates that the insect (called earworm in corn but bollworm in cotton) is now able to survive multiple genetically engineered traits in a pyramided variety. Other research has shown wide failure of traits supposed to protect against the western corn rootworm as well, leaving farmers facing big and potentially costly problems as resistance builds, according to the researchers. "With widespread use of genetically engineered crops, the targeted insects developing resistance to these protein is a major threat to the sustainability of the Bt technology," researcher Dilip Venugopal wrote in a summary of the group's findings. 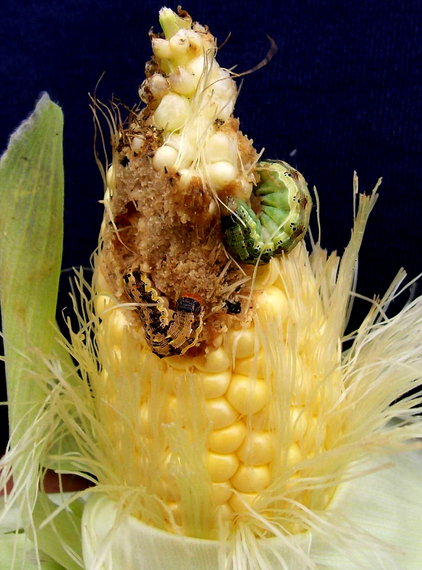 "Increasing damages by corn earworm to Bt field corn are reported already in North Carolina and Georgia, and corn earworm could become a major pest. We predict that corn earworm resistance to the Cry toxins is likely to increase, and spread. Therefore, the risk of damage to corn production across a large portion of U.S. is high." Venugopal is a science and technology policy fellow working with a division of the EPA. Fred Gould, an entomologist at North Carolina State University, said the Dively work is a "very important study," that does not bode well for future crop health. And University of Minnesota Extension Entomologist William Hutchinson said the study demonstrates a need for better monitoring of resistance in traits that still work. As the study showed, there is still very good effectiveness with varieties that contain both Vip3A+Cry1Ab, he pointed out. One key misstep has been reliance on the "refuge-in-a-bag" (RIB) system that allowed farmers to avoid setting aside part of their fields as areas free of the Bt trait, a practice proven to discourage resistance. With the RIB system, however, researchers have found that farmers actually encouraged resistance by spreading uneven low doses of the Bt toxin to feeding insects throughout their fields, which helped build up resistance in the insects over time. The companies behind the Bt traits have encouraged refuge-in-a-bag. Seed giant Monsanto Co., which made $5.8 billion in sales of corn seeds and traits last year, has touted refuge-in-a-bag as fast and convenient for farmers, allowing them to plant the specialized seed "fence row to fence row." The EPA shoulders a good deal of the blame for the problem, according to the agency's Office of Inspector General (OIG), which criticized the agency last year for its handling of the resistance issues. Among other missteps, the agency has been too reliant on the seed and chemical industry to self-report the resistance issues, and has not provided farmers or researchers with a direct means to report resistance incidents to the regulators, according to the OIG. The EPA also is too secretive with the information it does get from the seed companies, keeping compliance reports and monitoring data from the public. "Transparency is an EPA core value," the OIG wrote. "The EPA has both information and the means to enhance transparency regarding its regulatory oversight of genetically engineered crops such as Bt corn." The EPA said it is "conducting an analysis of this study and other information related to corn earworm resistance and will determine if improvements to the current resistance management strategies are warranted." The EPA said as part of that process, it will hold a public meeting with a panel of scientific advisers later this year. "There's nothing they can do about it," said Dively. "There is pretty strong evidence it's going to get worse," said Dively.